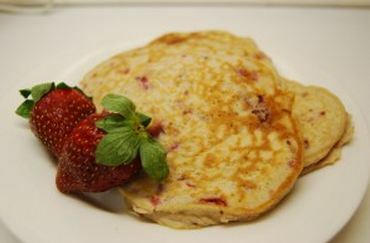 These pancakes are SUPER low in carbs and very light! Dixie Diners’ Bakesquick Mix is great to have on hand for when you need to dip back into a lower carb regimen. You can buy the mix from by clicking on the Amazon link below. You can add a couple chopped berries to give it color or simply have them plain. Make sure to keep your meal low carb by using low carb syrup. My favorite is Vermont Sugar Free Low Calorie Syrup available through the Amazon link below. It is just 2.5 carbs for 2 Tablespoons. Add sausage for more protein and to feel full longer. Directions:Mix together 2/3 Bakesquick mix, 2 Tablespoons melted Smart Balance Buttery Spread, 2 Tablespoons Unsweetened Original Almond Milk, 1 cup water, and 1 egg. Use a little less than 1/4 cup batter to make 7 pancakes. Pour batter SLOWLY to form nice round pancakes. Flip when lightly browned. Makes 7 pancakes. Serves 3 (2 pancakes per serving). Freeze the 7th for a snack! For waffles: use 1/2 cup water only. Keep Dixie Diner’s Bakesquick Mix on hand for making light and tender biscuits, cookies, pizza crust, pancakes, shortcakes, pot pie toppings and more! New 2 lb size Makes 90 biscuits! Informative and Fun Radio Session Today in downtown West Chester, PA!